Search and rescue crews found one Vail climber dead and another injured but still alive near Aspen’s iconic Maroon Bells on Friday. The Maroon Bells near Aspen (Wiki Commons). 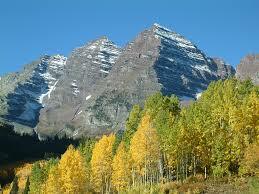 The Pitkin County Coroner’s Office identified the dead climber is Jarod Wetherell, 37, of Vail. The surviving climber is David Richardson, 32, also from Vail. With help from the Colorado National Guard’s High Altitude Aviation Training Site (HAATS), which operates military helicopters out of the Eagle County Regional Airport, Wetherell’s body was extricated at approximately 1:45 p.m. The Pitkin County Sheriff’s Office and Mountain Rescue Aspen found Richardson at approximately 11:15 a.m. Friday in the Bell Chord area on the east aspect of North Maroon Peak. The pair had been reported missing by a friend in Vail late Wednesday after reaching the summit of either North or South Maroon Peak but failing to report back in. Rescuers found no sign of the missing climbers or indication of what route they had taken on Thursday. Weather conditions slowed the search, but a break in the weather on Friday allowed rescuers to continue their search by HAATS helicopter. The extent of Richardson’s injuries were still being evaluated, according to rescue officials.